Alcatraz Island, commonly referred to as simply Alcatraz or locally as The Rock, is a small island located in the middle of San Francisco Bay in California, United States. Due to its isolation by the cold, strong, hazardous currents of San Francisco Bay, Alcatraz was used to house Civil War prisoners as early as 1861. In 1898, the Spanish-American War increased the prison population to more than 450 inmates. After the 1906 San Francisco earthquake, civilian prisoners were transferred to Alcatraz for safe confinement. During 1912 a large cellhouse was added, and in the 1920s the large three story structure was nearly at full capacity. In 1934 it became a federal penitentiary and housed such famous prisoners as Al Capone and George "Machine Gun" Kelly. The prison closed in 1963. A 19-month long occupation of the island by allied Native Americans (1969-1971) succeeded in helping to establish tribal rights of self determination by drawing attention to the plight of the American Indian. President Richard Nixon responded by rescinding the Indian termination policy of the 1950s-1960s. Alcatraz Island became a national recreation area in 1972 and received landmark designations in 1976 and 1986. Today, it is a historic site operated by the National Park Service as part of the Golden Gate National Recreation Area. It hosts nearly 1.5 million visitors each year. Flowers on Alcatraz. In the background is the Social Hall, destroyed by fire during the Native American occupation. The earliest recorded owner of the island of Alcatraz is one Julian Workman, to whom it was given by Mexican governor Pio Pico in June 1846 with the understanding that the former would build a lighthouse on it. Later that same year John C. Fremont purchased the island for $5,000 in the name of the United States government. Following the Mexican-American War Californiabecame a territory of the U.S. government. The United States fought a legal battle with Fremont over ownership of Alcatraz, since he had purchased it under the government's name. 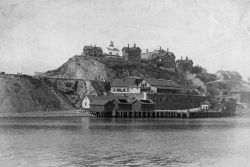 Following the acquisition of California and the onset of the California Gold Rush the following year, the U.S. Army began studying the suitability of Alcatraz Island for the positioning of coastal batteries to protect the approaches to San Francisco Bay. In 1853, under the direction of Zealous B. Tower, the Corps of Engineers began fortifying the island, work which continued until 1858. The island's first garrison, numbering about 200 soldiers, arrived at the end of that year. When the American Civil War broke out in 1861 the island mounted 85 cannons (increased to 105 cannons by 1866) in casemates around its perimeter, though the small size of the garrison meant only a fraction of the guns could be used at one time. Alcatraz never fired its guns, though during the war it was used to imprison the west coast's Confederate sympathizers. Following the war in 1866 the army determined that the fortifications and guns were being rapidly rendered obsolete by advances in military technology. Modernization efforts, including an ambitious plan to level the entire island and construct shell-proof underground magazines and tunnels, were undertaken between 1870 and 1876 but never completed. Instead the army switched the focus of its plans for Alcatraz from coastal defense to detention, a task for which it was well suited because of its isolation. In 1867, a brick jailhouse was built (previously inmates had been kept in the basement of the guardhouse), and in 1868 Alcatraz was officially designated a long-term detention facility for military prisoners. Among those incarcerated at Alcatraz in the 1870s were Hopi Native American men who were imprisoned for refusing to relinquish their children, as required, to government-run Indian Boarding schools. On March 21, 1907, Alcatraz was officially designated as the Western U.S. Military Prison. In 1909, construction began on the huge concrete main cell block, designed by Major Reuben Turner, which remains the island's dominant feature. It was completed in 1912. In order to accommodate the new cell block, the Citadel, a three-story barracks, was demolished down to the first floor, which was actually below ground level. The building had been constructed in an excavated pit (creating a dry "moat") to enhance its defensive potential. The first floor was then incorporated as a basement to the new cell block, giving rise to the popular legend of "dungeons" below the main cell block. During World War I the prison held conscientious objectors. San Francisco residents complained about the starkness of Alcatraz's prison environment in the midst of San Francisco Bay. The Military responded by bringing in soil and plants. Select prisoners were trained in landscaping, created a garden, and continued their maintenance. In the late 1920s a baseball field was added. The United States Disciplinary Barracks on Alcatraz was acquired by the United States Department of Justice on October 12, 1933, and the island became a federal prison in August 1934. During the 29 years it was in use, the jail held such notable criminals as Al Capone, Robert Franklin Stroud (the Birdman of Alcatraz), Jose Sierra, James "Whitey" Bulger and Alvin Karpis, who served more time at Alcatraz than any other inmate. It also provided housing for the Bureau of Prison staff and their families. When Al Capone arrived on Alcatraz in 1934, prison officials made it clear that he would not be receiving any preferential treatment. While serving his time in Atlanta, Capone, a master manipulator, had continued running his rackets from behind bars by buying off guards. "Big Al" generated incredible media attention while on Alcatraz though he served just four and a half years of his sentence there before developing symptoms of tertiary syphilis and being transferred to the Federal Correctional Institution at Terminal Island in Los Angeles. George "Machine Gun" Kelly arrived on September 4, 1934. At Alcatraz, Kelly was constantly boasting about several robberies and murders that he had never committed. Although this was said to be an apparent point of frustration for several fellow prisoners, Warden Johnson considered him a model inmate. Kelly was returned to Leavenworth in 1951. Robert Stroud, who was better known to the public as the "Birdman of Alcatraz," was transferred to Alcatraz in 1942. He spent the next seventeen years on "the Rock"—six years in segregation in D Block, and eleven years in the prison hospital. In 1959 he was transferred to the Medical Center for Federal Prisoners in Springfield, Missouri. He died at the Springfield Center at the age of 73, after 54 years of incarceration, of which 42 were in segregation. Roy G. Gardner, bank robber and celebrated outlaw, dubbed by the newspapers across the West Coast as the "Smiling Bandit," the "Mail Train Bandit," and the "King of the Escape Artists." He was imprisoned on Alcatraz from 1934 to 1938. James "Whitey" Bulger spent 3 years on Alcatraz (1959-1962) while serving a sentence for bank robbery. While there, he became close to Clarence Carnes, also known as the Choctaw Kid. In November 1962 he was transferred to Leavenworth Federal Penitentiary in Kansas, and in the following year to Lewisburg Penitentiary. He was released after serving nine years in prison. In its 29 years of operation, there were 14 attempts to escape from Alcatraz prison involving 34 inmates. Officially, every escape attempt failed, and most participants were either killed or quickly re-captured. However, the participants in the 1937 and 1962 attempts, though presumed dead, disappeared without trace, giving rise to popular theories that they were successful. On December 16, 1937, Theodore Cole and Ralph Roe had gradually filed through iron bars in the prison's mat shop in the industries building and escaped. The intense fog of that day prevented them from being spotted by watch tower guards. 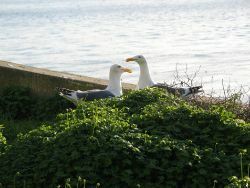 The two were never seen again but the severe weather conditions at the time have led to a consensus that they were swept out to sea by the strong current in the bay. However, they were listed as numbers one and two on the FBI's "most wanted" list. There were several unconfirmed sightings of the pair. A failed escape attempt by six prisoners on May 2, 1946, led to the so-called "Battle of Alcatraz," which lasted until May 4. Two guards and three inmates were killed in the battle, with another 11 guards and one inmate injured. Two of the surviving convict participants were later executed for their roles in the escape attempt turned revolt, and one received a life sentence. On June 11, 1962 Frank Morris, John Anglin and Clarence Anglin successfully carried out one of the most intricate escapes ever devised. Behind the prisoners' cells in Cell Block B (where the escapees were interned) was an unguarded 3-foot (0.91 m) wide utility corridor. The prisoners chiseled away the moisture-damaged concrete from around an air vent leading to this corridor, using tools such as a metal spoon soldered with silver from a dime and an electric drill improvised from a stolen vacuum cleaner motor. The noise was disguised by accordions played during music hour, and their progress was concealed by false walls which, in the dark recesses of the cells, fooled the guards. The escape route then led up through a fan vent; the fan and motor had been removed and replaced with a steel grille, leaving a shaft large enough for a prisoner to climb through. Stealing a carborundum cord from the prison workshop, the prisoners had removed the rivets from the grille and substituted dummy rivets made of soap. The escapees also stole several raincoats to use as a raft for the trip to the mainland. Leaving papier-mâché dummies in their cells with paint brush bristles as hair, they escaped. The official investigation by the FBI was aided by another prisoner, Allen West, who also was part of the escapees' group but was left behind. Articles belonging to the prisoners (including plywood paddles and parts of the raincoat raft) were located on nearby [[Angel Island (California)|Angel Island]. The official report on the escape states the prisoners drowned while trying to reach the mainland in the cold waters of the bay. The case was closed by the FBI on December 31, 1979 after a 17 year investigation. By decision of Attorney General Robert F. Kennedy, the penitentiary was closed on March 21, 1963. 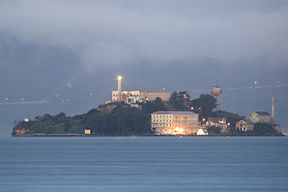 It was closed because it was far more expensive to operate than other prisons; half a century of salt water saturation had severely eroded the buildings; and San Francisco Bay was being badly polluted by the sewage from the approximately 250 inmates and 60 Bureau of Prisons families on the island. The United States Penitentiary in Marion, Illinois, a new, traditional land-bound prison opened that same year to serve as a replacement for Alcatraz. 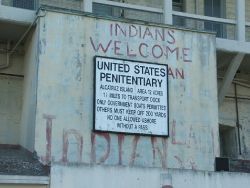 A lingering sign of the 1969-1971 Native American occupation (2006 Photograph). Beginning on November 20, 1969, a group of Native Americans from numerous tribes occupied Alcatraz Island. The occupation lasted for nineteen months, from November 20, 1969 to June 11, 1971, and was forcibly ended by the U.S. Government. The stated intention of the occupation was to gain Indian control over the island for the purpose of building a center for Native American Studies, an American Indian spiritual center, an ecology center, and an American Indian Museum, though evidence suggests that the occupation was largely symbolic. During the occupation, several buildings were damaged or destroyed by fires, including the recreation hall, the Coast Guard quarters and the Warden's home. The origins of the fires are unknown. A number of other buildings (mostly apartments) were destroyed by the Government after the occupation had ended. Graffiti from the period of occupation are still visible at many locations on the island. During the occupation, the Indian termination policy, designed to end federal recognition of tribes, was rescinded by President Richard Nixon, and the new policy of self-determination was established, in part as a result of the publicity and awareness created by the occupiers. The entirety of Alcatraz Island was listed on the National Register of Historic Places in 1976, and was further declared a National Historic Landmark in 1986. 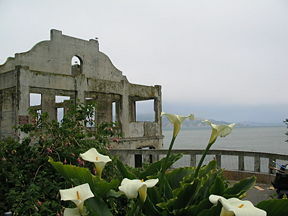 In 1993, the National Park Service published a plan entitled Alcatraz Development Concept and Environmental Assessment. The plan doubled the amount of Alcatraz accessible to the public to enable visitors to enjoy its scenery and bird, marine, and animal life, such as the California slender salamander. The parade grounds. Carved from the hillside during the late 19th century and covered with rubble since the government demolished guard housing in 1971, the area has become a habitat and breeding ground for black-crowned night herons, western gulls, slender salamanders and deer mice. The Agave Path, a trail named for its dense growth of agave. Located atop a shoreline bulkhead on the south side, it provides a nesting habitat for night herons. Cisterns. 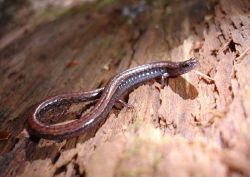 A bluff that, because of its moist crevices, is believed to be an important site for California slender salamanders. Cliff tops at the island's north end. Containing a onetime manufacturing building and a plaza, the area is listed as important to nesting and roosting birds. The powerhouse area. A steep embankment where native grassland and creeping wild rye support a habitat for deer mice. Tide pools. A series of them, created by long-ago quarrying activities, contains still-unidentified invertebrate species and marine algae. They form one of the few tide-pool complexes in San Francisco Bay. Western cliffs and cliff tops. Rising to heights of nearly 100 feet (30 m), they provide nesting and roosting sites for sea birds including pigeon guillemots, cormorants, Heermann's gulls and Western Gulls. Harbor seals can occasionally be seen on a small beach at the base. Historic gardens were planted by families of the original Army post, and later by families of the prison guards. They fell into neglect after the prison closure in 1963. After 40 years they are being restored by a paid staff member and many volunteers, thanks to funding by the Garden Conservancy and the Golden Gate National Parks Conservancy. The untended gardens had become severely overgrown and had developed into a nesting habitat and sanctuary for numerous birds. Now, areas of bird habitat are being preserved and protected, while many of the gardens are being fully restored to their original glory. In clearing out the overgrowth, many of the original plants were discovered to still be growing where they had been planted - some over 100 years ago. Numerous heirloom rose hybrids, including a Welsh rose that had been believed to be extinct, have been discovered and propagated. Many species of roses, succulents, and geraniums are to be found growing among apple and fig trees, banks of sweet peas, manicured gardens of cutting flowers, and wildly overgrown sections of native grasses with blackberry and honeysuckle. A panorama of Alcatraz as viewed from San Francisco Bay, facing east. Sather Tower and UC Berkeley are visible in the background on the right. Alcatraz Island in San Francisco Bay is famous for its historical roles as a Civil War fortress, a military prison and a maximum-security federal penitentiary that housed some of America's most notorious criminals. Known as "The Rock," it gained fame through the 1962 film "Birdman of Alcatraz" and the 1963 book "Escape From Alcatraz." The island has also been the site of three American Indian occupations, the longest and best-known of which lasted from 1969 to 1971 and succeeded in the rescinding of the federal Indian termination policy. This history brings nearly one and a half million visitors to the island each year. The Global Peace Foundation has proposed razing the structures on the island and transforming it into a Global Peace Center. Terming San Francisco the "Geneva of the West," they envision the new Alcatraz as an artistic, educational and spiritual mecca which will attract millions of people from all over the world. Whether Alcatraz remains a historic reminder of a painful history or is utilized as a center to usher in what some view as a "new and peaceful paradigm for all humanity" remains to be seen. Whatever course is taken, Alcatraz will surely continue to attract visitors in the coming years. ↑ Federal Bureau of Prisons, A Brief History of Alcatraz. Retrieved February 20, 2009. ↑ BBC, April 18, 2001, Alcatraz, San Francisco, California, USA. Retrieved February 20, 2009. ↑ California State Military Department, Post at Alcatraz Island. Retrieved February 20, 2009. ↑ Golden Gate National Parks Conservancy, Alcatraz Preservation Project: Exposing the Layers of An American Landmark (pamphlet). ↑ Brenda J. Child, Boarding School Seasons: American Indian Families, 1900-1940 (Lincoln: University of Nebraska Press, ISBN 0803264054), 13. ↑ Philip Grosser, Alcatraz—Uncle Sam's Devil's Island: Experiences of a Conscientious Objector in America During the First World War (London: Kate Sharpley Library, 2003, ISBN 9781873605240). ↑ Federal Bureau of Investigation, June 8, 2007, A Byte out of History: Escape from Alcatraz. Retrieved February 20, 2009. ↑ Troy Johnson, The American Indian Occupation of Alcatraz Island, California State University, Long Beach. Retrieved February 20, 2009. ↑ Gerald D. Adams, "Alcatraz Proposal Highlights Wildlife Plan Would Open Up More of Rock," San Francisco Examiner News section, pg. A1. ↑ Michelle Locke, February 2, 2008, Activist wants to transform Alcatraz into global peace center, The Lawrence Journal-World. Retrieved February 20, 2009. ↑ 11.0 11.1 Global Peace Foundation, The Alcatraz Conversion Project. Retrieved February 20, 2009. Federal Bureau of Prisons. A Brief History of Alcatraz. Retrieved February 20, 2009. National Park Service. Alcatraz Island. Retrieved February 20, 2009. Ocean View Publishing. Alcatraz History. Retrieved February 20, 2009. Wellman, Gregory L. 2008. A history of Alcatraz Island 1853-2008. Images of America. Charleston, SC: Arcadia Pub. ISBN 9780738558158. Wickline, Melissa Paige. 2007. The Political History of Alcatraz Island. Thesis (M.L.A.S. in Liberal Arts and Science)—Vanderbilt University, Dec. 2007. OCLC 231857097. Map of Alcatraz with marker pictures. This page was last modified on 18 February 2019, at 21:06.